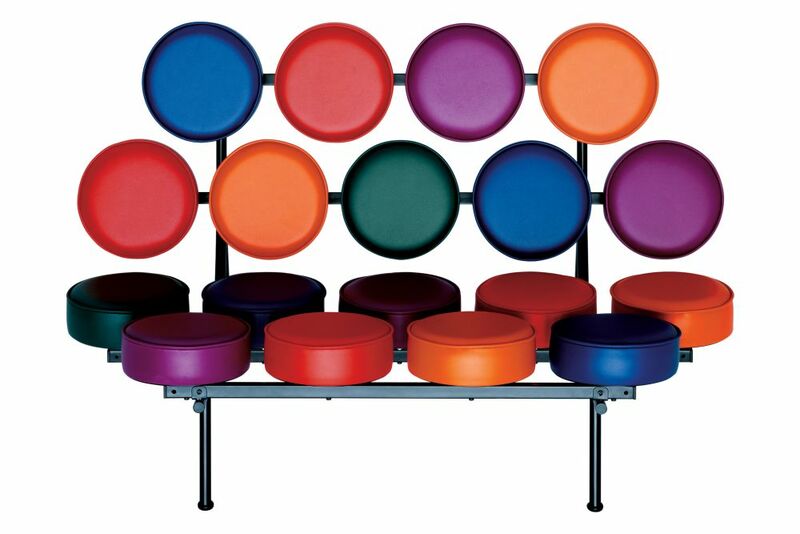 George Nelson‘s Marshmallow Sofa transforms the traditional sofa into a playful three-dimensional object with eighteen colourful cushions attached to a simple steel frame. Dark red, orange, green, purple and blue. Rectangular steel profiles, lacquered in black. The sofa consists of 18 cushions. 44 cm / 35.5 cm with applied load, measured in accordance with EN 1335-1 /. Extension element for mounting between 2 sofas, frame with 6 cushions. Sold separately. Due to the unusual form and construction of the Marshmallow Sofa, it is one of the most extraordinary sofas in the history of design. An extension element with six additional cushions can be mounted between two sofa units, making it possible to create a sofa of indefinite length. The individual cushions are upholstered with a robust vinyl cover.